Ethnic Ugyhurs who attacked a police post in northwestern China’s troubled Xinjiang region last week were members of a Muslim family who had become increasingly devout as they struggled for almost 10 years to make a living after losing land to Han Chinese in what they considered an unfair business deal, sources said. 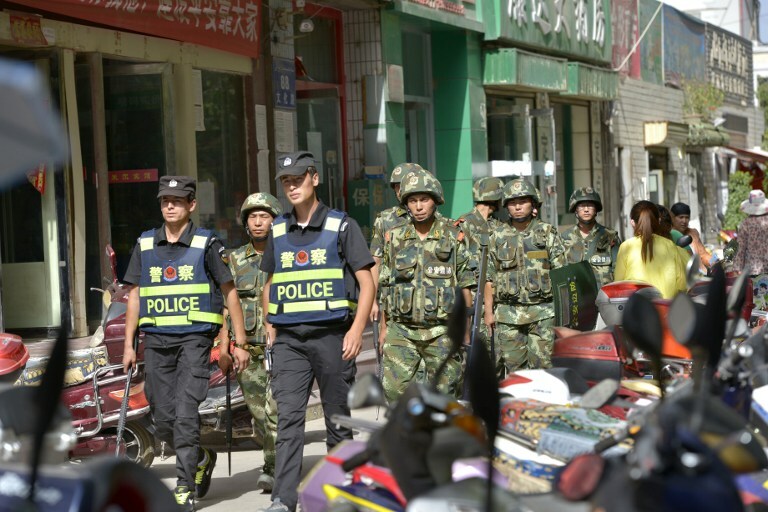 The June 22 incident, in which police at a traffic checkpoint in the Tahtakoruk district of southwestern Xinjiang’s Kashgar (in Chinese, Kashi) city in Kashgar prefecture were attacked with knives and bombs, left at least 19 dead, according to local sources. Among those killed were three police officers and 16 Uyghurs designated by police as “terrorists,” in addition to an unknown number of bystanders, sources said. Most of the attackers had come from one family based originally in Tazghun town in Kashgar prefecture’s Yengisheher (Shule) county, but who had later moved, Memet Sawut, a police officer at Tazghun town’s police station, told RFA’s Uyghur service. “Because they had left our town, we were not aware of their plans,” he said. Though police had forcibly shaved the beards of male family members and had removed women’s veils, “no one in their family had been sentenced to death or to prison terms, so I don’t think they carried out their attack out of frustration,” he said. Police determined that the perpetrators of the June 22 assault were all related “when we checked the corpses” after the attack, said Tazghun police officer Mey Jisheng. The next day, police searched for senior family member Atawulla Dawut to question him on his possible role in directing the attack, and surrounded him outside a city hotel, Mey said. In addition to those killed in the attack, 60 people have been taken into custody by police for interrogation, Mey said. “We do not know yet how many will be linked to the attack,” he said. Though Atawulla’s family was not initially religious, “after their land was given to a Han Chinese businessman, they suffered financially,” a resident of Tazghun town said, speaking on condition of anonymity. “During those days of hardship, they became very pious people,” the source said. Later, police designated Atawulla and his relatives as a “key family” to monitor and watched their every move, the source said. “Police constantly searched their homes, removing scarves and veils from their women, and Atawulla was always busy rescuing either his son or sons-in-law from police custody,” he said. “For almost 10 years, this family had no peace,” he said. Xinjiang’s Turkic-speaking Uyghurs frequently chafe at what they consider ethnic discrimination and assaults on their Islamic culture by China’s government in the name of what Beijing calls its fight against the “Three Evils of terrorism, separatism, and religious extremism” in the region. In fact, Chinese government forced them whole family to suiside in order fully take over their land for Chinese? How come this can be call 'Uyghurs attack'? From whole article it is clear, Chinese authorities forced them to die. So sad news, confusing reporting. Don't you guys have different image other than this? You have been using the image again and again.